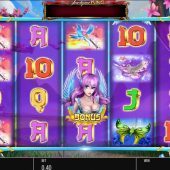 Angel Princess slot is a welcome change to endless rehashes of the Ted and King Kong Cash 20-line Blueprint games, entertaining as they are. This new mechanic has fairytale characters spinning over a cartoon fantasy landscape and naturally you hear tinkling music and chime effects as you play to compound the theme, if it's your sort of thing. It is linked to Blueprint's 'Jackpot Strike' progressive network at most casinos, which means randomly Jackpot Strike symbols can overlay the reels and take you to a reveal game where the big prize is a (tiny) possibility. Failing that, can these fairies wave their magic wands over our bankroll? 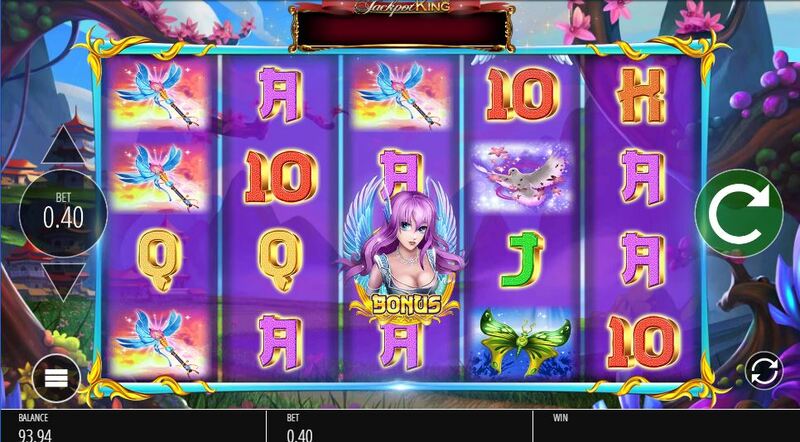 You can bet just 20-coins to play Angel Princess which is a 40-payline slot over 5 reels of 4 rows each. I preferred to pay the 40 to avoid the half-pays which would make many wins miniscule, although some decent wins are possible. There are stacked symbols so you can usually see two or three on one reel but the Wild Heart often appears stacked 4-rows high and can do so on all reels, awarding 12.5x bet for 5-of-a-kind or 500x for a full screen which is certainly possible! Magical Wilds - on any spin reels slow and tens of extra Wilds are added to them. Super Bonus Reels - on any spin tens more bonus scatters are added. Enchanted Spin - the magic wand lights up the grid and ensures a decent win via Angel Princess mystery symbols. If the Angel Princess appears 3 times in view anywhere (it's on all 5 reels) then you are given 5 free games which can be retriggered. During these blocks of Angel Princess logos are added to the reels and when they stop spinning any in view (yawn!) will transform into a random symbol except the scatter. You can gamble this bonus when it's triggered to Super, Mega or Epic Bonus which will all add more scatters and Angel Princess mystery symbols to the reels to increase your potential rewards.